The filmmaking duo behind Fake Charmer Productions is ambitious and unstoppable. Topher Hansson and Chris Goodwin do their best not to let a little thing such as money get in their way when it comes to producing quality films. Their films Truth Cocktail and On the 7th Date are testaments to their skill when they have a clear goal in mind. With both films the budget was beyond tight, but with some creativity and a lot of hard work they were still able to create end products that were captivating and easy to watch; and that is something others may never achieve, no matter the size of their budgets. So when Topher approached me with their new film Dark Roast I knew I had to watch it. The film is the first short to come from Topher and Chris, and the first horror as well. The film’s focus is on band mates Vanessa and Nathan. It’s Halloween night at Grind Haus, the coffee shop they work at. Business is slow, and all there’s left to do is waste time before their shift is over and their first big gig begins. But as the bodies start piling up, and a psycho keeps calling, they’re left wondering if they’ll make it through the night alive. There is an unbelievable amount of death and gore packed in to this 20 minute film, and things are so over the top at times you can’t help but chuckle. That includes the characters themselves. Nathan’s lackluster attempts to get people’s attention, be it through a drum-off; chopping his hand off in the blender; or trying to win the affection of Penelope; are all worthy of both pity and a snicker or two. Vanessa’s cold indifference to the entire situation was delivered by Kati McCarron with an expression that would make professional poker players jealous. Penelope’s poetry is so nonsensical that it warrants the most confused expression a person can muster. And Geoffrey’s disgust at his coworker’s lack of professionalism made it all the more sweet when he meets his demise. 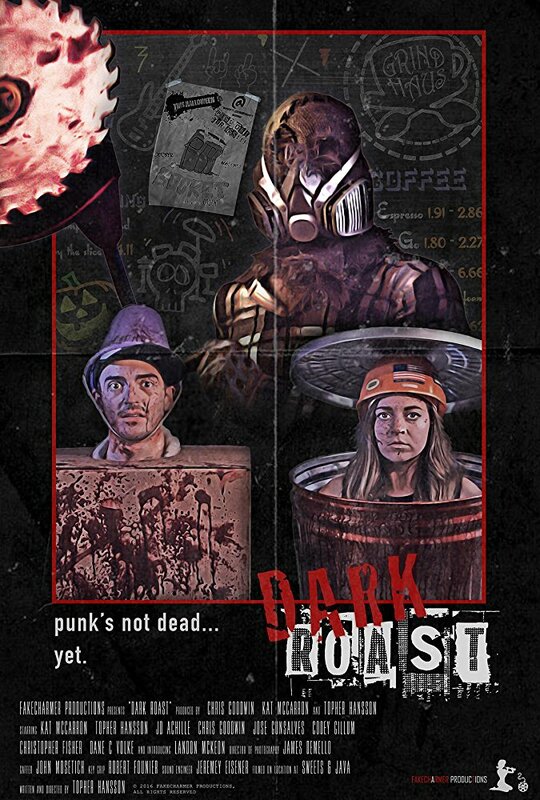 Dark Roast may have a Halloween theme to it, but it’s the perfect horror-comedy for any time of year. The bizarre absurdity of the plot, coupled with the goofy nature of the characters work in tandem to make a short that’s quirky and entertaining from the first death to the last.